The Darfur Dream Team was founded following NBA Hall of Famer Tracy McGrady’s trip to the Darfuri refugee camps with Enough’s Omer Ismail and John Prendergast. After spending days hearing the harrowing stories of young Darfuris and of their desire for a better education, he decided to act and the Darfur Dream Team Sister Schools Program was born. 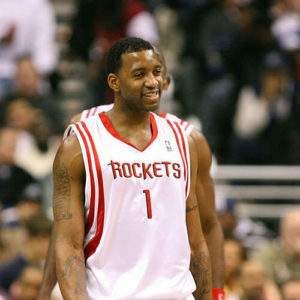 In 2010, McGrady changed his jersey number to “3”, to increase awareness about the 3 “P’s” of Enough’s advocacy agenda: peace, protection, punishment. Tracy and John also wrote op-eds for The Houston Chronicle and ESPN. In 2011, McGrady became a member of the Clinton Global Initiative and made a “commitment to action” in which he pledged to expand the Darfur Dream Team Sister Schools Program by scaling up the direct online communication between Darfuri and U.S. students, which subsequently occurred.